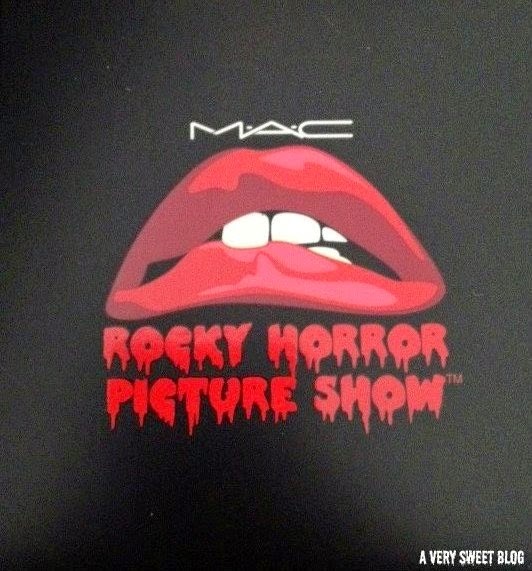 I was only suppose to purchase ONE lipstick from the MAC Rocky Horror Picture Show makeup collection! I ended up purchasing FIVE things (no self control), because they didn't release the lipstick I (everyone) wanted (FrankNFurter) until LAST! Marketing ploy! HaHaHa But GUESS WHAT!?! 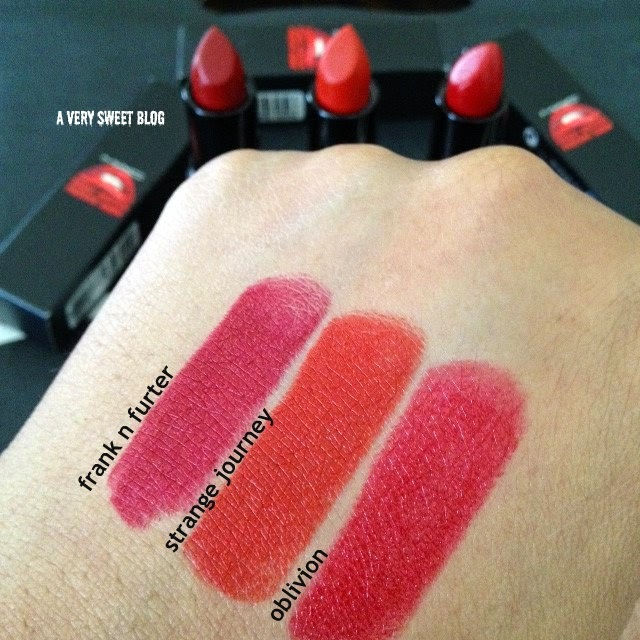 I like the other two lipsticks (Oblivion & Strange Journey), better than FrankNFurter (the one I was waiting for)! HAHAHA Getting these items was PURE MADNESS! MAC literally had people waiting two days (they're known for delays & hysteria when collections are released), BUT they did offer FREE OVERNIGHT SHIPPING. So that was a plus. I kept checking their website morning, noon and night via phone and laptop. I was literally a zombie by the time I purchased everything. MAC does this on purpose (low supply & high demand)! 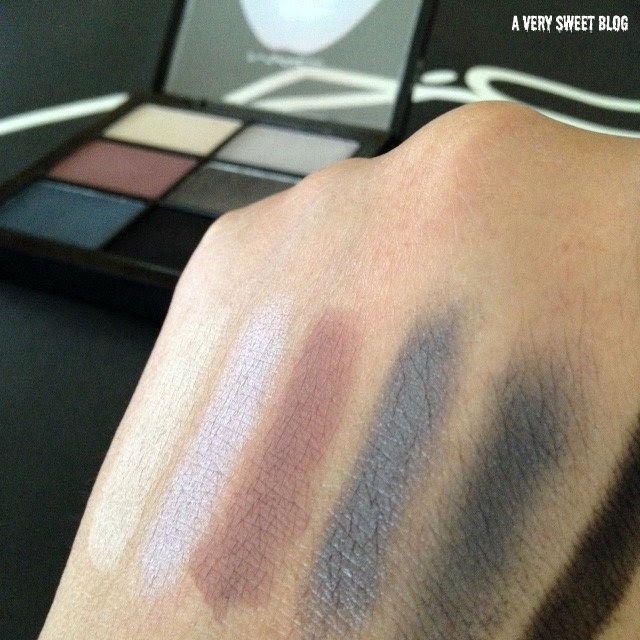 Beauty bloggers (like moi) covet MAC collections! However, some buy mass quantities and sell them for ridiculous prices on eBay! I've only seen clips of THIS movie (never saw it in it's entirety). I knew it was a classic and I love red lipsticks. I've been good this year as it relates to MAC collections. I've only purchased from two (MAC Playland and this one), of their MANY COLLECTIONS. 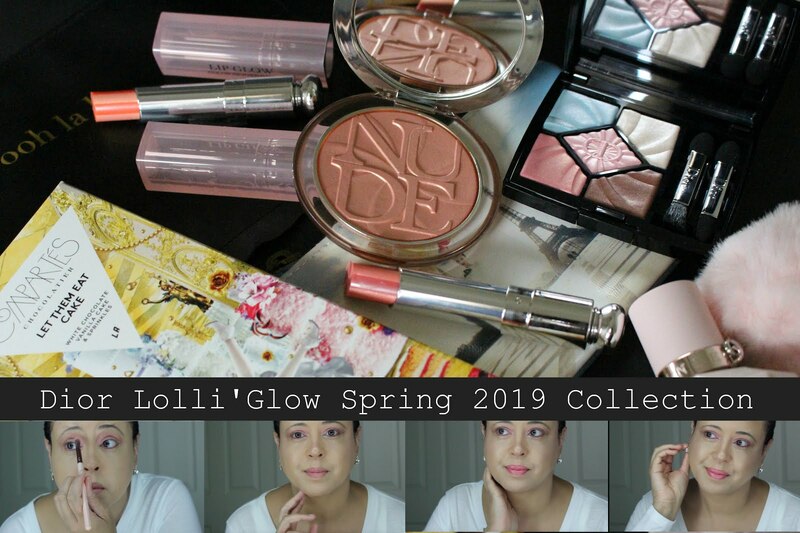 For tips on how to score MAC collections online, read mine HERE. 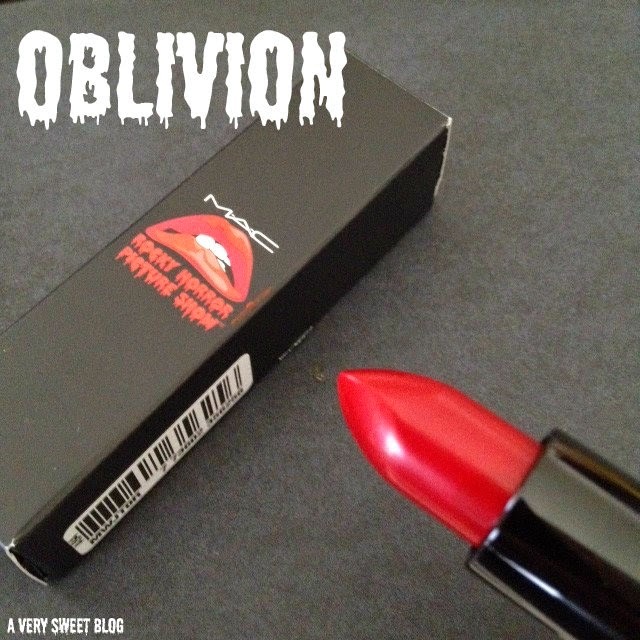 MAC Oblivion Lipstick: There were FOUR lipsticks in the collection (Sin, Oblivion, Strange Journey and FrankNFurter). I purchased THREE of them. I love them all, but my favorite is OBLIVION. It's a glossy red and absolutely fabulous. I've got to give it to MAC. They really knows lipsticks. I'm so glad I purchased this one. 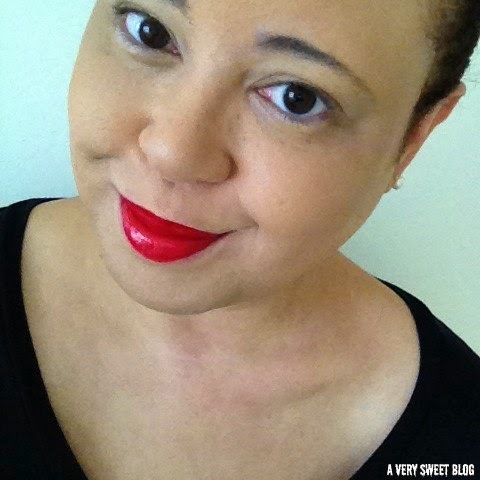 MAC Strange Journey Lipstick: This is an orange-y red lipstick! It's matte and I like it. It's perfect for Fall & Winter. 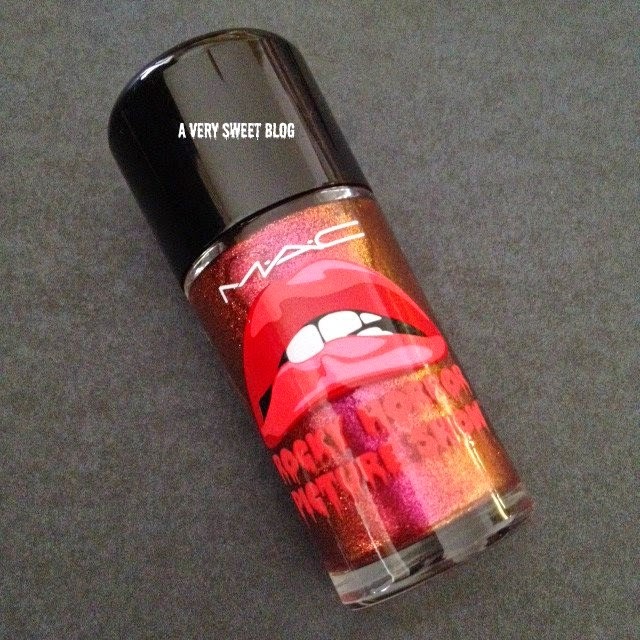 MAC FrankNFurter Lipstick: This is the lipstick that sold out online in like MINUTES! I bet because of the name! HaHaHa I was one of the lucky ones, so I'm giving one away to a lucky reader of AVSB. This lipstick is vamp enough for me! Sin lipstick (not pictured) is even more vamp, but I didn't purchase it. FrankNFurter reminds me of a deep berry wine (at least on me). 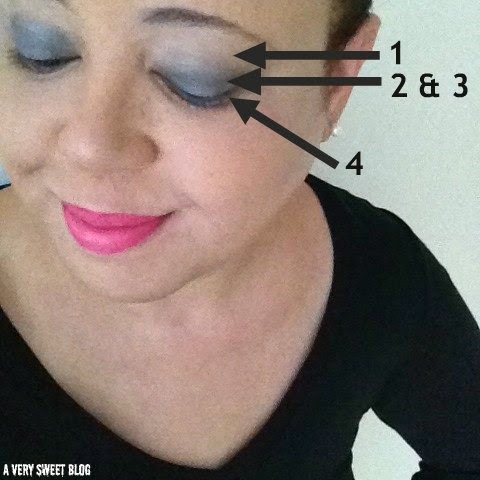 It can look different on other skin tones! It's also matte. I love the outer packaging of the products, but as you can see the inner with all the characters in the movie are awesome too. Below are the MAC Rocky Horror Picture Show lipstick swatches on my hand.Click pictures to make larger. 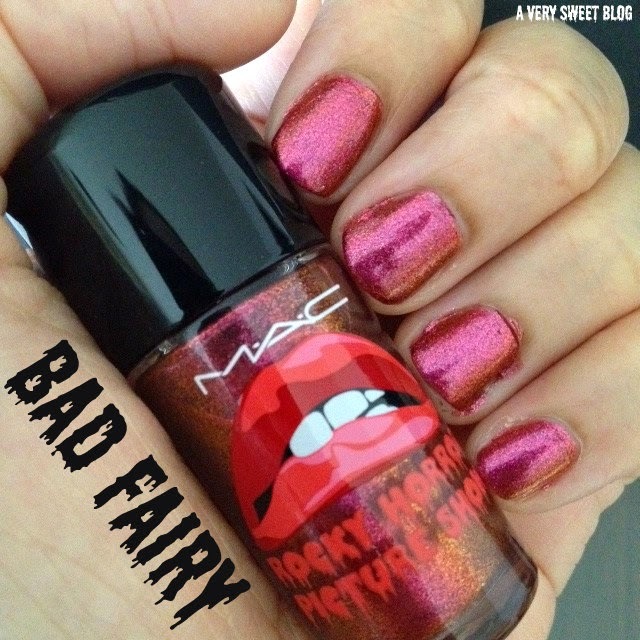 MAC Bad Fairy Nail Lacquer: There were TWO nail polishes in this collection. Since I purchased RED lipsticks, I went with Bad Fairy. I call it my glittery, glitzy, what color is it nail lacquer! HaHaHa It's red, purple, pink, orange and rust rolled into one. It's reading purple in the picture, but if you get this you'll definitely understand what I'm talking about. I've dissed MAC nail polishes in the past, but they seem to be getting a little better. Can't really tell with this one, because it took 3 coats! O_0 But it's pretty. However, prepare for glitter on your fingertips/skin when you take it off. HaHaHa Have you been to a party? Why YES! 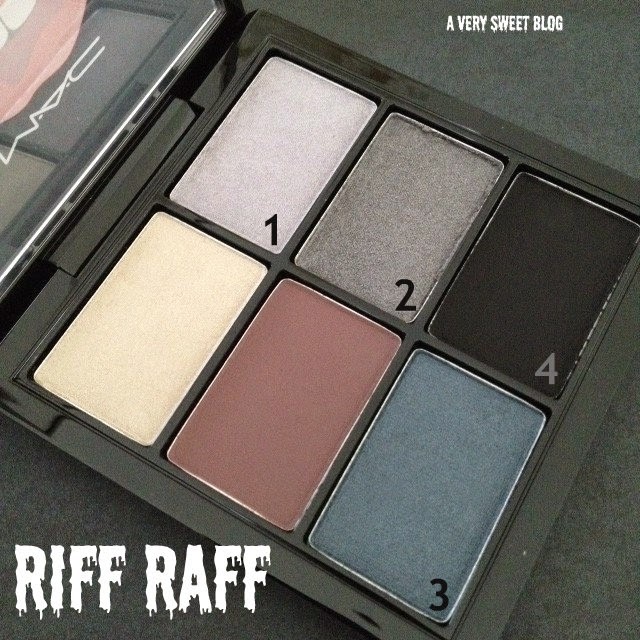 MAC Riff Raff Eyeshadow Palette: I can't stop laughing at the name of this palette! HaHaHa It's based on a character in the movie, that I show below. Well, I refuse to wear these shadows with a red lip (i'm not that good) so I paired 4/6 of the colors (I'm not an eyeshadow connoisseur) with a pink lip (FYI: my pink lip is NYX Soft Matte HERE). These shadows are pretty cool. I took a chance with purchasing this, because they're not the colors I usually go for, but sometimes you have to step out of your comfort zone, and just give things a chance. Hope you enjoyed my review! Have a great day! 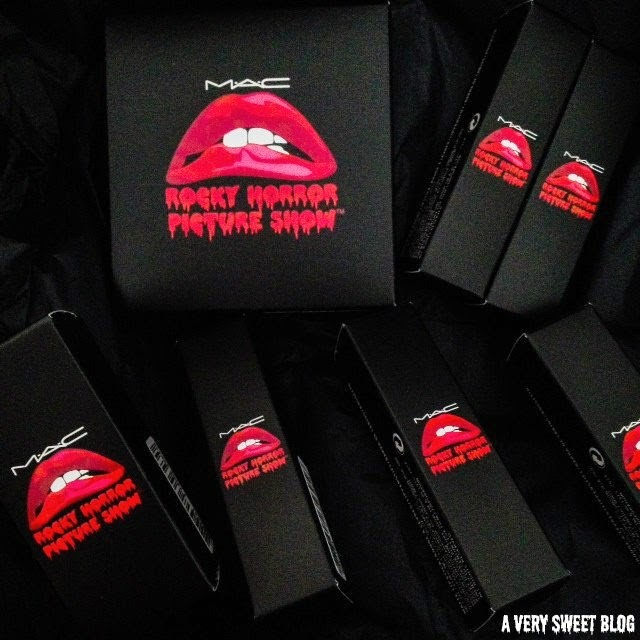 MAC Rocky Horror Picture Show Collection is Sweet. 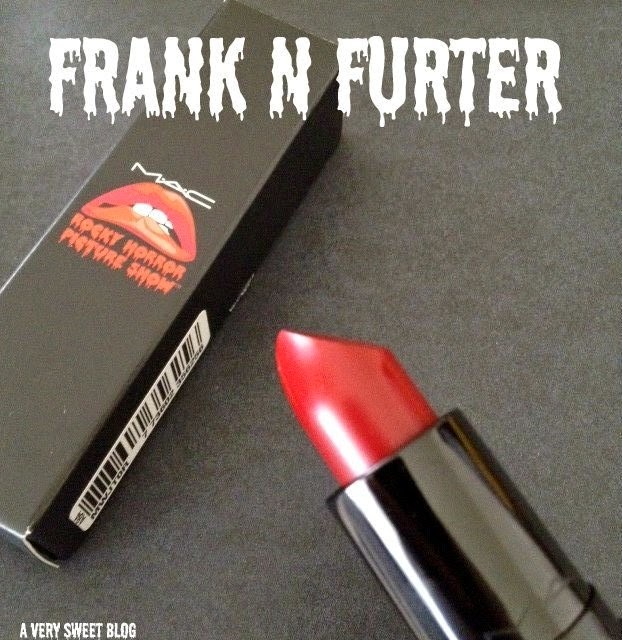 It always amazes me how crazy people go for MAC collections - I guess I'm more of a Chanel girl at heart, but I love a vamp red lipstick and FrankNFurter looks like the perfect fall shade to me! Crossing my fingers for the giveaway :) That said, I think my favourite from the collection is the polish, the way the colour look on your nails is just divine! Such a fabulous collection!! Love the lip colours so much...thanks for the giveaway Kim! I can see why you had no self-control over this collection, Kim. Wowee! All the lippies look fab on you, but that Oblivion is something else. I passed by a MAC store and saw the collection from afar but I was with the the kiddos so I didn't have a chance to go in. Must see if I can stop by and check it out in person. Amazing lipstick you look great in those colors. I can understand why you had no self control when it came to this collection (A great name as we head towards Halloween too) Those lipsticks are all such rich colours and perfect for the new season. The nail varnish looks a lovely shade too and one which I'm sure will be versatile throughout autumn and winter. Hope your week is going well. You are simply gorgeous in the Oblivion shade! It is funny that you liked the other shades more than the one you really wanted. You never know how something will turn out until you try it right? Ooh and I picked up a few edible goodies for you in Tokyo! Awesome collection! Oblivion looks amazing on you! Definitely a fun collection for the holidays! Love all the shades, of course you wear bold colors so well! What a fun collection! Those lip colors are gorgeous. MAC really can do no wrong when it comes to lips though haha! Haha, I tried to watch that movie for the first time the other day and I just couldn't do it. I got about half way through when the video froze and we decided it was sign, lol. The lipstick is beautiful, though! I'd have to agree that Oblivion is my favorite, it's just so beautiful and rich! I have soft spot for lipsticks. I find very hard to say no to pretty lipstick and these looks gorgeous. And I love your nail polish as well. I very rarely enter giveaways, just because I don't find myself lucky, yet for this one I will keep my fingers cross. How big is your makeup collection? You always seem to be adding fab products to it, time for a makeup tour! Love that FrankNfurter color!! FINGERS CROSSED!! The colors look great on you, and the collection looks so fun. MAC always have such amazing collections! Hope you're having a wonderful day! Too cool. I need a good red. 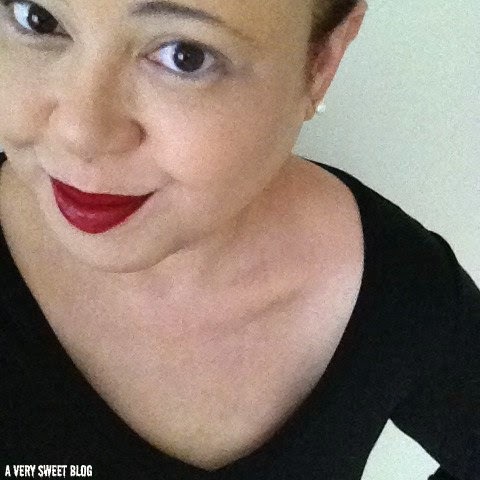 Another cool collection by MAC, the lipstick have good pigmentation, beautiful nailacquer too! What a cool collection! I'm loving the reds they chose. Thank you so much for the giveaway! Fun giveaway, especially for Halloween! I think this is a fun theme, and tend to buy my lipsticks in doubles, haha! 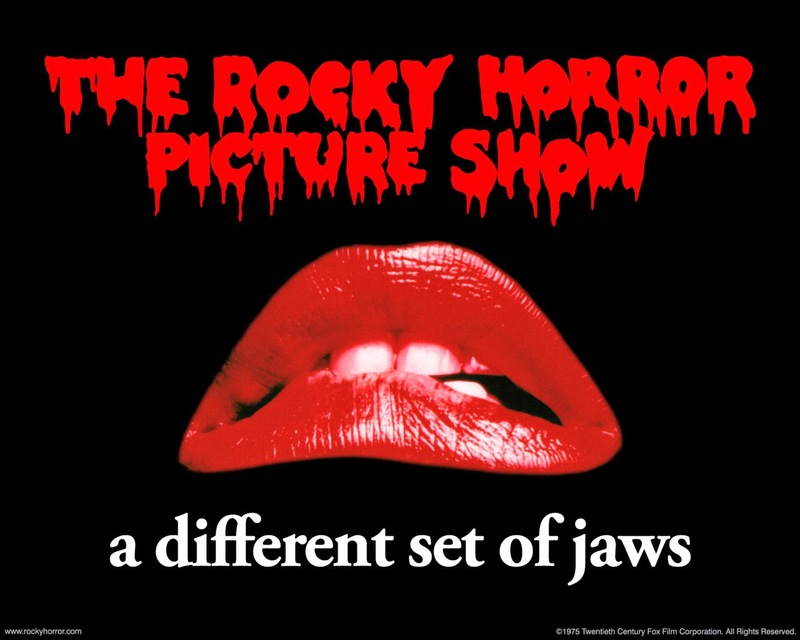 I have seen the Rocky Horror Picture Show many times. The first red lipstick looks amazing on you, it is definitely my favourite. 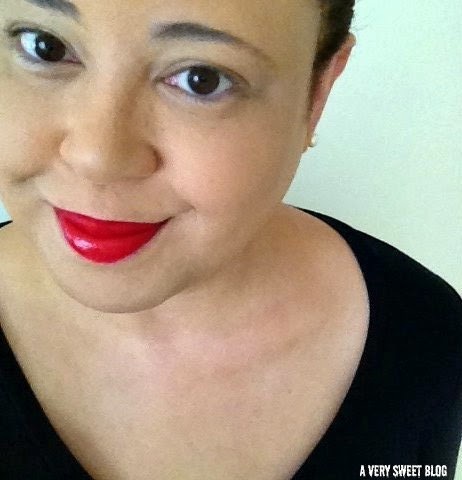 Those shades of red lipstick look great on you! The nail polish is nice and the package is so scary, haha! 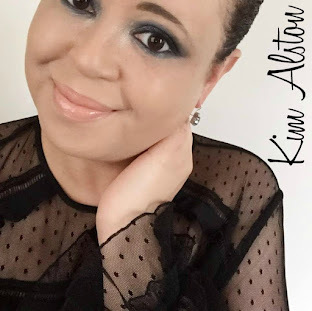 I love this post Kim! Despite owning about a million orangey reds I think I need Strange Journey now, too...it looks amazing on you! So happy MAC came out with this collection. If I don't win this giveaway I'm hunting it down myself!! You look gorgeous with all the shades, especially the first. You have such a nice complexion! This collection is so cool!! Love all those lipsticks on you and that palette is so pretty! Thanks for the giveaway Kim! Thanks for the giveaway! Such a good one! The colors are gorgeous! What a fun cosmetic line theme! THIS IS SO COOL! I love the lippy on you! 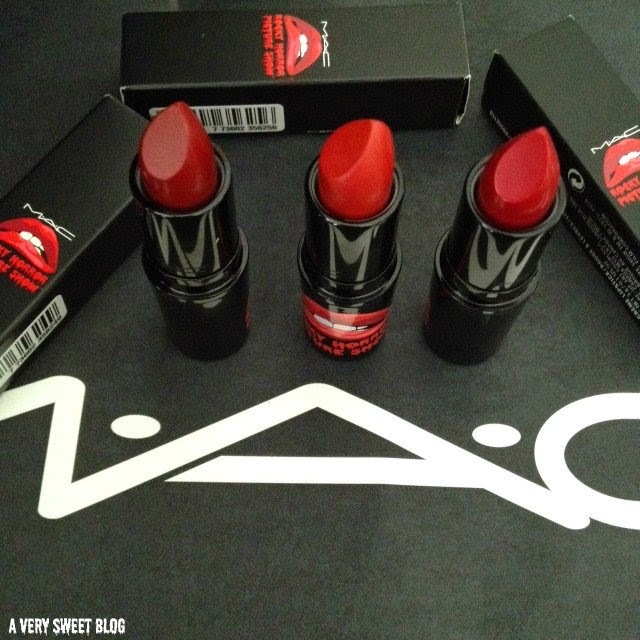 You were MADE for red lipstick! I really like that glittery polish too, not sure about having it all over my hands after though. Lovely review! ooh, ooh, ooh!!! love the packaging!! what a great collection. Beautiful collection, and it looks gorgeous on you! 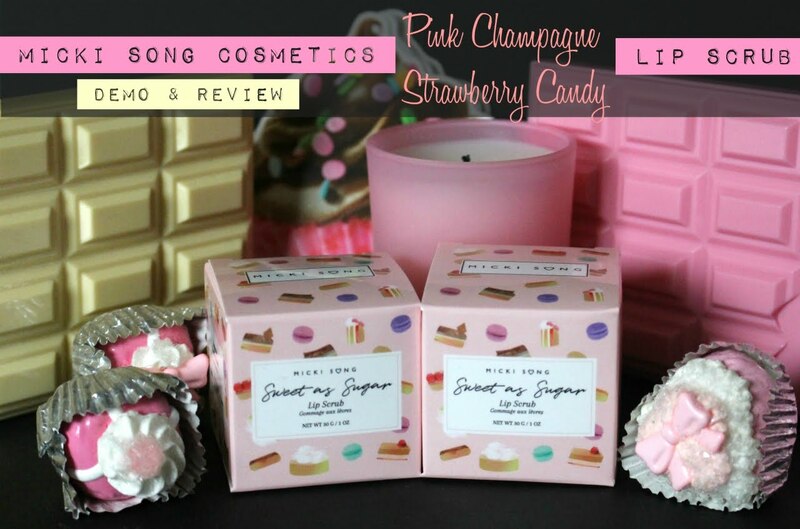 Thanks for this fabulous giveaway hun! awesome shades! 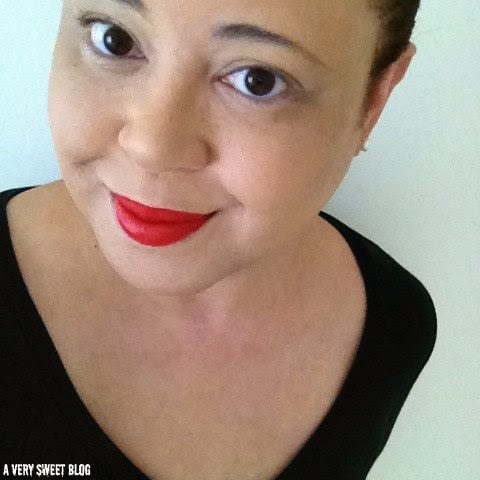 Totally adore red lipsticks! and the box is solo attractive! so many fabulous shades....who could resist! I don't blame you for buying all 5...and thank you for showing it to us...they do look great! So sweet and generous of you. As to the MAC polish, I was disappointed with them a couple of years ago and figure there are just way too many awesome companies out there for me to keep trying MAC polishes. Their makeup is good and I'll stick to that. But since you collect attractive packaging then these polishes are perfect in that aspect. 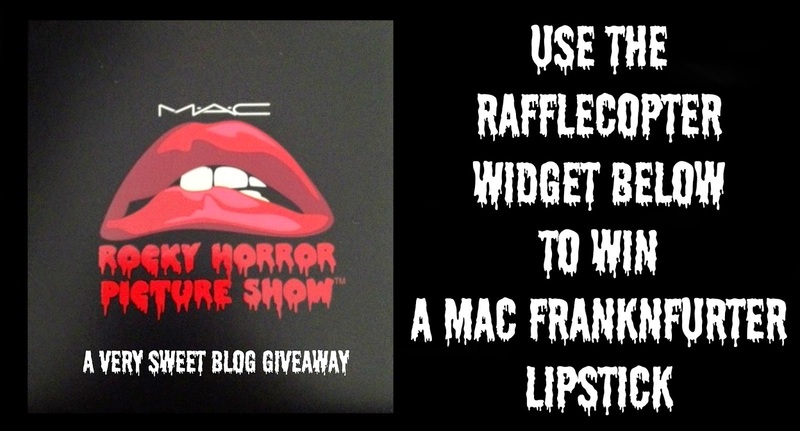 i love horror movies and would definitely love to win a lippie, too! Nice Collection I just wish they'd named something Time Warp lol. Great giveaway! I'd love to be able to try a MAC lipstick. Ohmygod this is such a fun collection, those lipsticks are BEYOND. I can't choose my favorite one between all of them! This is such an awesome collection and great review of it. 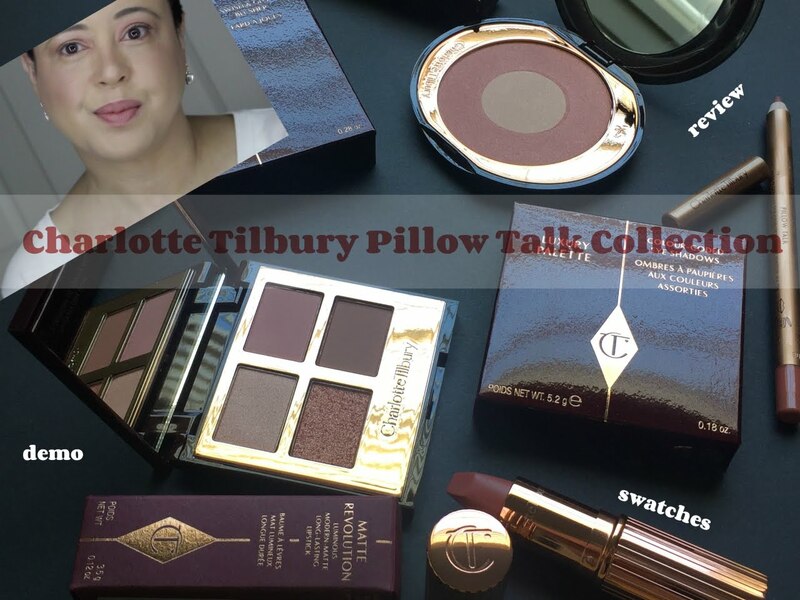 I really like getting to see swatches of the products before I go and get them. Thank you for the chance to win! I'm loving these colors! The lipstick would be so fun to wear, (Rafflecopter name is Kimberly). I rally want to try this product. This collection is amazing! 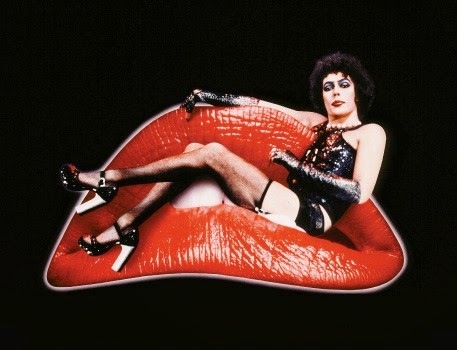 I LOVE RHPS! And the colors are GORGEOUS! Hope I win heehee!Great review Kim!